October 7, 2010 - Airbus Military has obtained certification for the A330 Multi Role Tanker Transport from Spanish military certification authority Instituto Nacional de Tecnología Aerospacial (INTA). This paves the way for first delivery of the aircraft to the Royal Australian Air Force (RAAF) in the coming weeks. 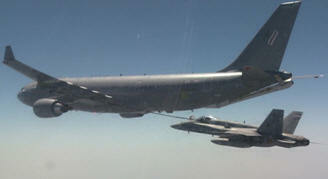 The A330 MRTT is now the only certified new-generation tanker and transport being offered to the world’s air forces. The military certificate was presented by INTA Director for Testing and Certification Bartolomé Marqués to Airbus Military, SVP Head of Engineering and Technology, Miguel Angel Morell on 5th October in Madrid. It covers the design and operation of all the military systems added to the aircraft in addition to the basic civil design, and especially the hose and drogue, as well as the all-new Airbus Military designed Aerial Refueling Boom System (ARBS). This approval follows the civil Supplemental Type Certificate (STC) for the conversion from the basic passenger A330-200 awarded by the European Aviation Safety Agency (EASA) earlier in the year. Airbus Military conducted more than 280 A330 MRTT flights and nearly 170 more on an A310 demonstrator to obtain the certification, and performed nearly 1,600 wet and dry contacts with receiver aircraft. Additionally more than 600 contacts were made with the A330 MRTT acting as receiver. Altogether more than one million pounds (450 tons) of fuel were transferred. Aircraft to which the A330 MRTT has now transferred fuel include F-16 and F-18 fighters, the E-3 AWACS with its large radome, and another A330 MRTT in a process known as buddy-buddy refueling. Airbus Military will deliver two MRTTs to the RAAF before the end of the year. The aircraft, equipped with two underwing hose-and-drogue refueling pods and the Aerial Refueling Boom System (ARBS), will be operated by 33 Squadron at RAAF Amberley. They can also carry 270 passengers in a two-class configuration. A total of 28 A330 MRTTs have been ordered by the Air forces of four nations (Australia, the United Arab Emirates, Saudi Arabia and the United Kingdom). The Airbus Military A330 MRTT is the most advanced and most cost-effective tanker/transport aircraft flying today. The large 111 tons / 245,000 lb basic fuel capacity of the successful A330-200 airliner, from which it is derived, enables the A330 MRTT to excel in Air-to-Air Refueling missions without the need for any additional fuel tank The A330 MRTT is offered with a choice of proven air refueling systems including an advanced Airbus Military Aerial Refueling Boom System, and/or a pair of under-wing hose and drogue pods, and/or a fuselage refueling unit. Thanks to its true wide-body fuselage, the A330 MRTT can also be used as a pure transport aircraft able to carry up to 300 troops, or a payload of up to 45 tonnes/99,000 lb. It can also easily be converted to accommodate up to 130 stretchers for Medical Evacuation (MEDEVAC). In summary the A330 MRTT is the most efficient aircraft of its kind. Airbus Military is the only military and civic transport aircraft manufacturer to develop, produce, sell and support a comprehensive family of airlifters ranging from three to 45 tons of payload. Within Airbus, Airbus Military is responsible for the A400M program, as well as the Multi Role Tanker Transport (MRTT) A330 and for further military derivatives based on Airbus civil aircraft. Together with the smaller C295, CN235 and C212, Airbus Military is the global leader in the market segments for light and medium-sized military transport aircraft. Altogether Airbus Military has sold more than 1,000 aircraft with over 650 flying with more than 100 operators worldwide.